Connect a non-B&O TV, CD/DVD player, or any other line-level audio source into your Bang & Olufsen BeoLink Active using the "PC" socket. THIS CABLE ONLY WORKS WITH BEOLINK ACTIVE, NOT WITH ANY OTHER B&O PRODUCTS! IT IS MADE TO SPECIAL ORDER - PLEASE CONTACT US IF YOU WISH TO PLACE AN ORDER. Suitable for Beolink Active type 161x or 163x ONLY! 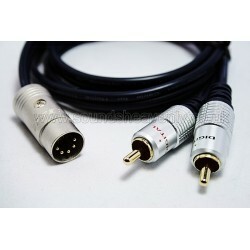 PLEASE DO NOT BUY THIS CABLE UNLESS YOU ARE CONNECTING IT TO A BEOLINK ACTIVE LINK ROOM BOX - IT WILL NOT WORK WITH ANY OTHER B&O PRODUCTS! Connect a non-B&O TV, CD/DVD player, or any other line-level audio source into your Bang and Olufsen Beolink Active using the "PC" socket. This cable is NOT suitable for other B&O applications - only for Beolink Active devices fitted with a PC socket. Additionally you will need to check the Type Number printed on your Beolink Active box and specify this when ordering your cable - if you are in any doubt, please ask! Simply press "PC" on your Beo4 remote control whilst in the same room as the Beolink Active box to select the PC input and listen to music from the source connected to this cable.